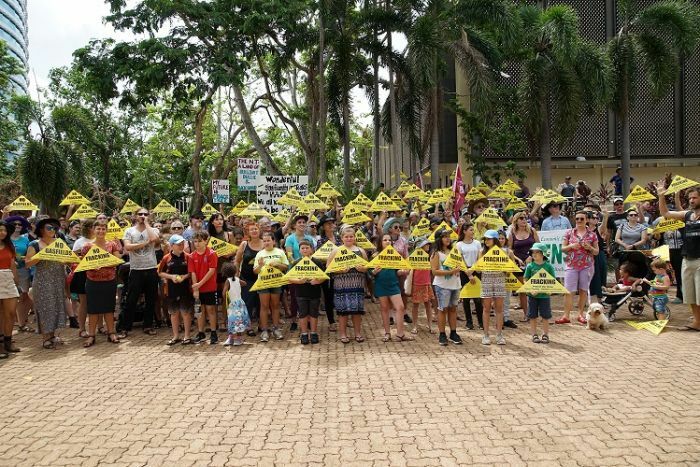 The Northern Territory Government has faced a backlash from protesters over its decision to lift a moratorium on fracking, while the Chief Minister travelled interstate for a conference. 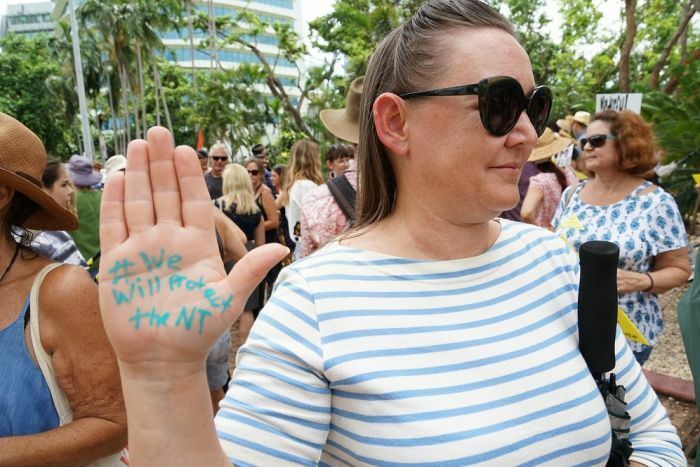 About 250 people gathered outside the Northern Territory Parliament to protest against the decision announced by Chief Minister Michael Gunner on Tuesday. The opponents yelled "shame, Gunner, shame", and called for the Chief Minister to come out and address the crowd. However, Mr Gunner was in Kununurra attending a forum on northern development. The Government was accused of betraying the public after taking the moratorium on fracking to the last election. "It's a bit sad when a Government gets in saying they'll listen to scientific evidence and the community on this issue and yet same business as usual," one woman said. Many protesters were concerned about the effects of hydraulic fracturing on the Territory's water and an increase in greenhouse gas emissions. "This is actually my first protest," local musician David said. "This is the first issue that's really engaged me to get off my behind and get involved. "I think it's just because water is just such a precious resource and we need it to live." An Indigenous man said he travelled all the way from Queensland to support traditional owners protesting against fracking. "I think we know what's going to kill our land and what's going to actually make it better for us, we don't live in the dark," he said. Northern Territory Minister for Natural Resources Ken Vowles faced the media earlier, and said he had been stopped by people in the street since Tuesday's announcement. He said all members of Government had been contacted or approached by their constituents over the decision, which he described as "difficult" to make. "As a Government we haven't taken this lightly and we had to make tough decisions as a government, but with a scientific inquiry that's come out, they've put those recommendations out and we've made the decision to go ahead," Mr Vowles said. "The emotion involved in all of this over the last 18 or 19 months has really been significant, but as a government we made a decision, we'll move on. "The next job is to make sure that all these recommendations are implemented, that all the work's been done, and that it's were looking after the Territory for future generations as well. "This has been a thorough, thorough scientific inquiry and report that's been put out." Federal Treasurer Scott Morrison denied the Federal Government had held the NT to ransom on fracking, in exchange for a bigger share of GST. Federal politicians, including the Prime Minister, have not been shy about applying pressure on the NT to resume fracking. "I don't know how the politicians can look their children in the eye, [it's a] disgrace," one man said.